An elegant living room is one that doesn’t just draw people’s eyes but one that draws them in, makes them want to stay and, when they leave, has them leaving happy. In the past, a living room was a showpiece, a formal parlor used only when entertaining guest. Today, living rooms are still places to entertain but also places where friends and family can relax and be comfortable. 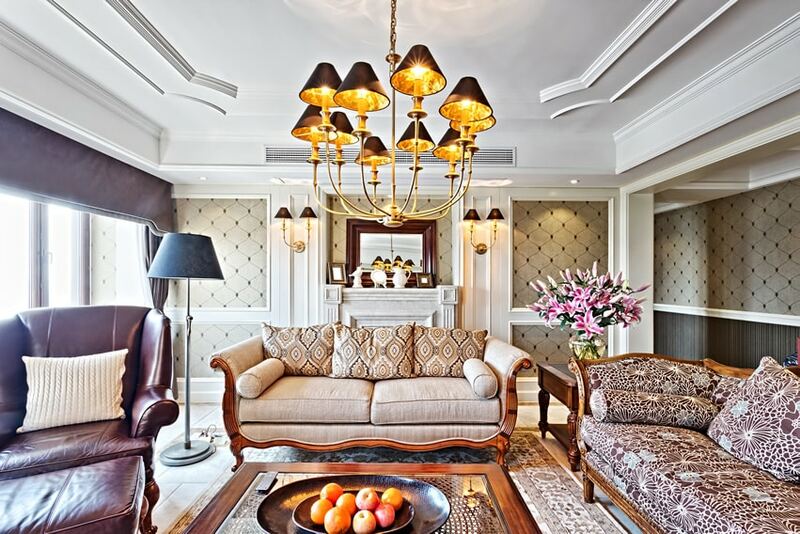 In the image above this Asian-contemporary space looks elegant and luxurious with its eye-catching cove ceiling with a large crystal chandelier. You can also see marble panels applied on one wall as accent with white marble moldings. 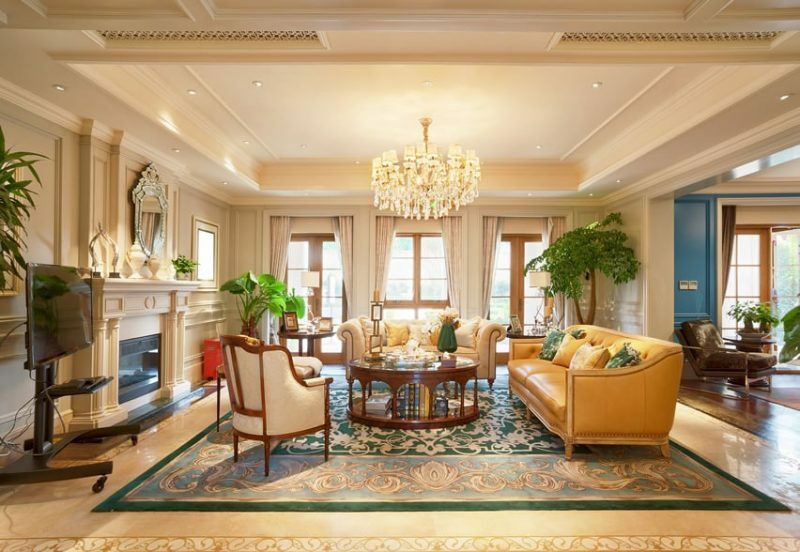 You will also notice the elegant hallway lined with gold wallpaper and a large window, making the space look brighter. Furniture are kept simple with off-white fabric upholstery and dark wengue-stained framing. Your living room should be the center of your social life, so you want to design a room centered around encouraging conversation and interaction. To this end, a basic element of a living room is the seating arrangements. What you provide your guests to sit on – a sofa or two, several chairs, a loveseat – should be comfortable and also comfortably placed. Seats should be placed in a way that encourages the easy flow of conversation. Make people seated can see their companions easily. They shouldn’t have to strain their necks or contort their bodies to see whose speaking. The living room is a place for conversation to happen and the décor of a living room should have a few things to spark conversation. Have a low coffee or end table, a few open shelves and cabinets and stock them with a few good books or curious nick-knacks. Have a few interesting framed photos and inspiring works of art scattered around. Have a focal point, something on which people’s eyes will fist land on upon entering . This could be a nice architectural feature like windows with a great view or a cozy fireplace. Or you can try and design a focal point such as an accent wall or prized piece of artwork or an interesting antique. It could even be an entertainment feature such as a games table, a television set or a sound system The focal point should face the entry way or the entry point of the room and the room should be designed so the focal point really stands out and there is nothing else that competes with it. Remember, the décor of your living room should inspire curiosity but it should never be cluttered. Your living room shouldn’t become a depository of things you don’t know what to do with, rather it should be filled with things you love and provide your guests with a glimpse into your personality. This should inspire them to open up and be comfortable enough to encourage them to share themselves with you and others. Your coffee table in particular should not be cluttered. Coffee tables are often the visual center of the room. Have a few focal pieces on your coffee table but don’t fill it to high with plants for example. Keep things low and simple and make sure that your guests have an unobstructed view of the room. 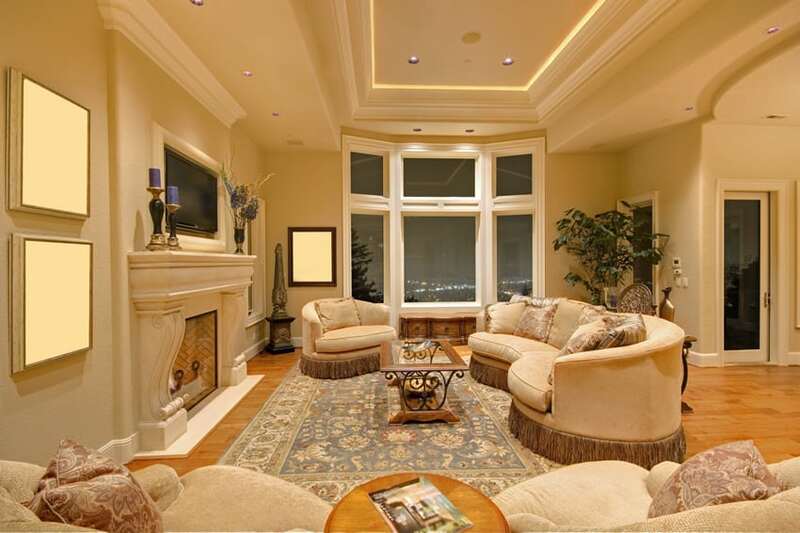 The lighting of your living room is an important element as well. If you have windows, take advantage of whatever natural light you can. This will give your living room the illusion of spaciousness. For when it gets dark, try using a few well-placed lamps or candles to lend a soft and warm glow to the room. Avoid harsh overhead lighting that can be glaring and unfaltering. This all-white themed living room looks stylish as it adds different textures to give it more personality. You will notice the use of white bricks for the TV wall, a clear glass above the center fireplace and a combination of matte and shiny materials. The horizontal louvers in the window also contributes to the patterns and textures in the room. A classic country-style home with elegant and classic furniture pieces. 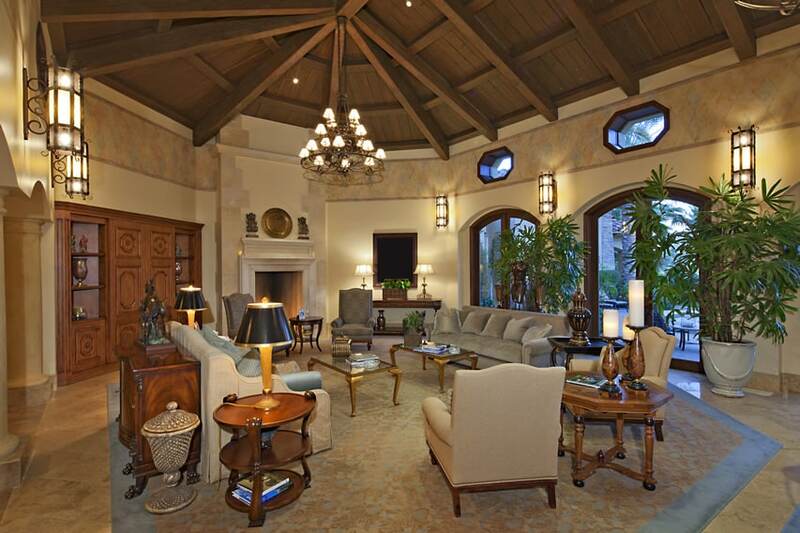 Walls are painted in a light beige color with an accent band of Tuscan tiles on the upper-half of the high-ceiling living room. Exposed trusses and wood planks can be seen on the ceiling and are painted over in a dark beige color and also has a large wrought iron chandelier to accentuate the space. Wooden pieces are varnished Mahogany wood, and plants were also used to add an outdoor element to the space. A modern Living Space with a fairly small size, but is able to seat a lot of people. For the walls, it uses a light cool gray tone which complements the darker cool grays of the seat upholstery and the blue accent pieces. 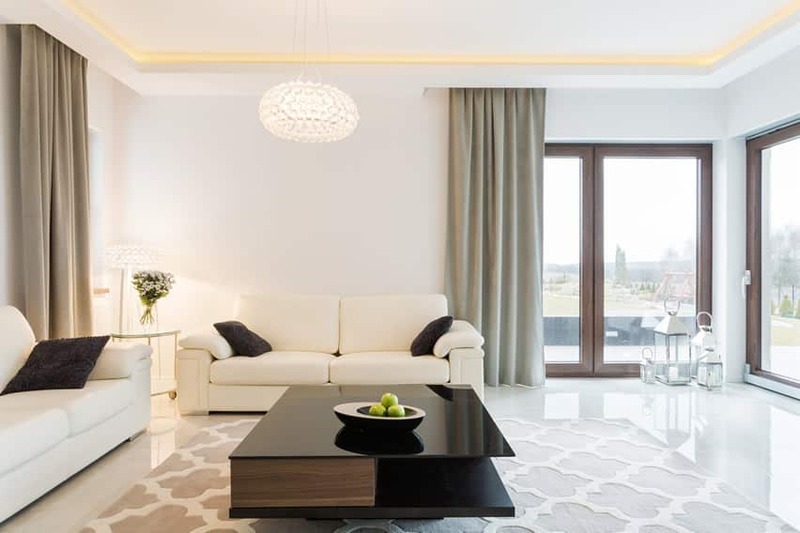 The floor material used is in a dark wengue color, but the white rug helps counter the dark flooring material, making the sofa and chairs pop out. 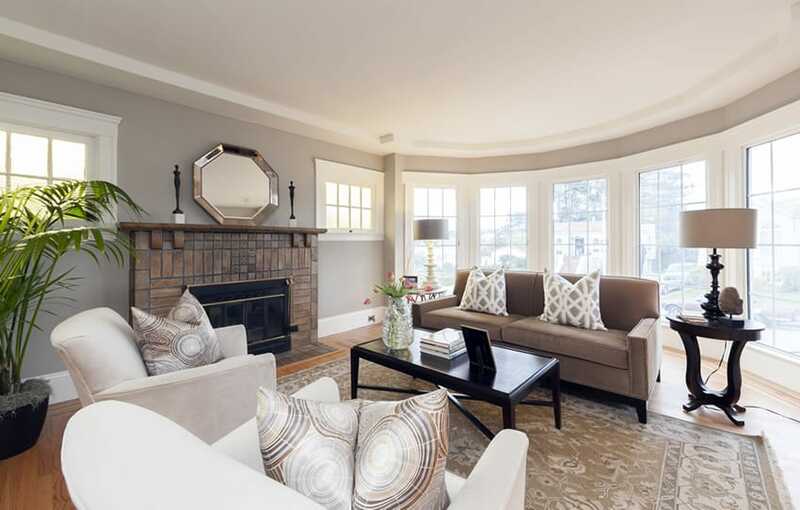 Another classic living space with a design based on curves and flowing lines. You will notice arches in the architectural features, round columns, and even furniture with no corners. Floors for this Living Room is solid wood Pine, and furniture are all upholstered in an oatmeal colored fabric. 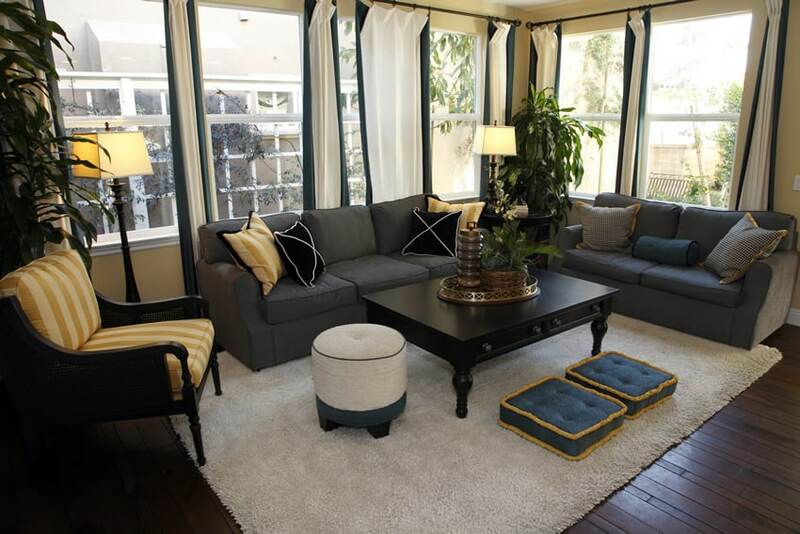 It also has a large traditional rug with a blue background, adding a pop of subtle color to the space. 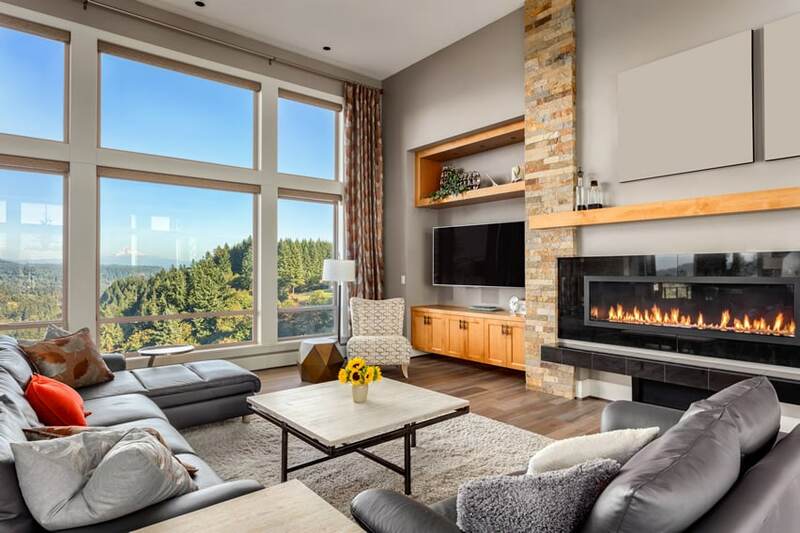 This modern indoor living room creates the free feeling of being outdoors with accent pieces like tropical ornamental plants, and small wood logs. The smooth oakwood stained floors contrasts the rough brown bricks on one side of the wall. 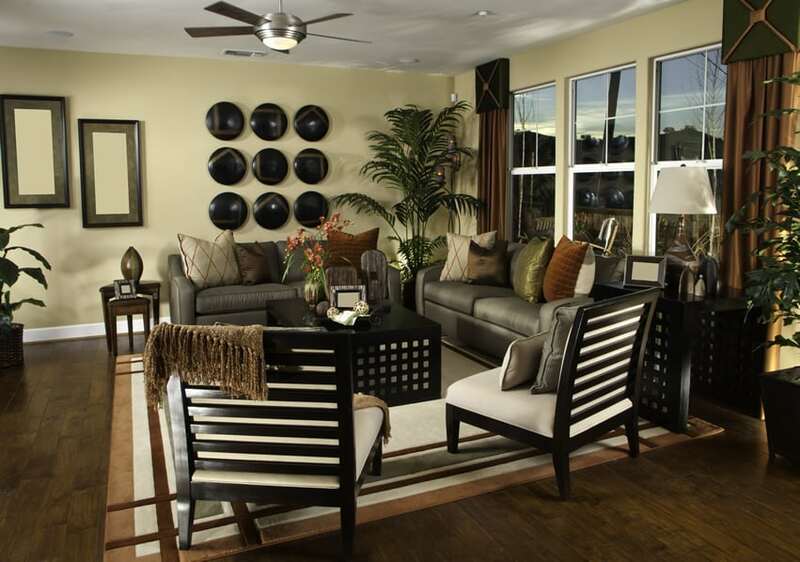 These browns are balanced by the white walls and gray sofa upholstery. 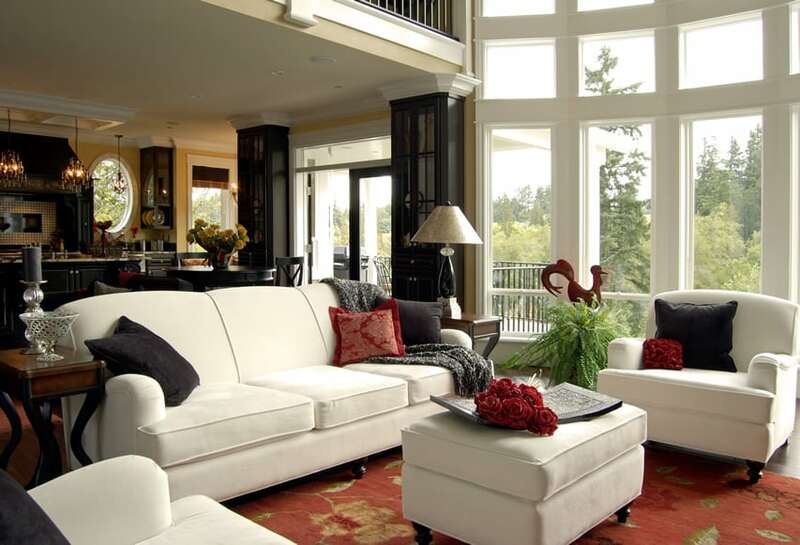 This big living room creates a very classy vibe with its moldings and panels on the white walls and ceiling. The big chandelier at the center together with the mirrors and white pleated curtains add more elegance to the space. A touch of playfulness is added with the 3 sofas in assorted sizes, styles, and colors. One being a one seater sofa with white upholstery and oakwood framing, while the two others are in white and yellow upholstery, respectively. This is a small living room with a classic vibe. The dominant colors are black and white with surfaces that vary in texture. 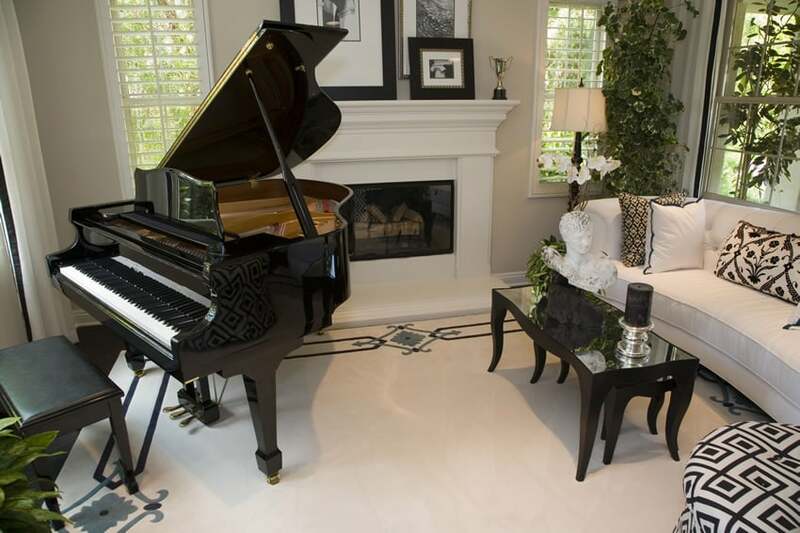 Black glossy finish could be found on the piano and the glass covering the fireplace and the center table. The furniture framing are stained wengue while the rest of the room is white. Pillows and carpets have classic black and white patterns and some plants are added to accentuate the straightforward color scheme. 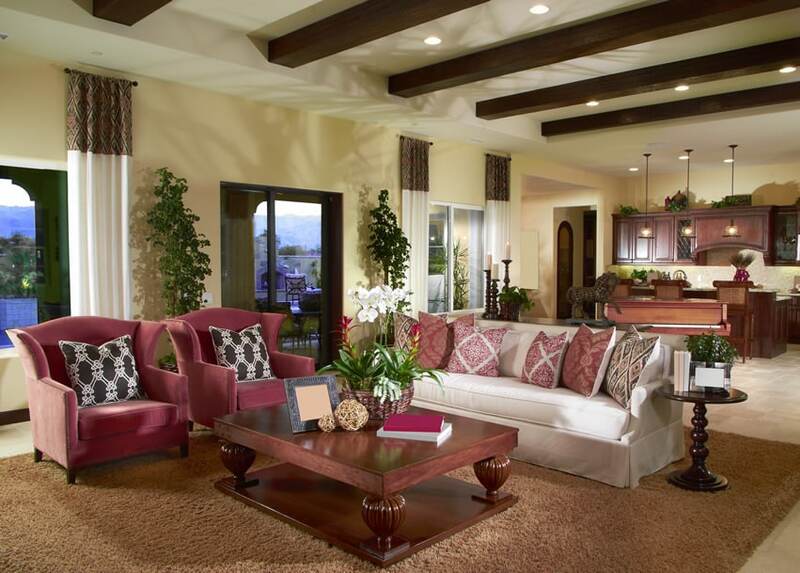 This is an elegant living room that makes use of cherrywood for the walls, ceilings, and exposed trusses. A big golden chandelier demands attention at the center of the ceiling, right above the square center table with cherrywood framing and clear glass on top. The upholstery and carpet is covered with oatmeal and brown swirly patterns in an elegantly carved wood framing. The strong reddish color of cherrywood and browns are balanced by the white floors and classic fireplace. 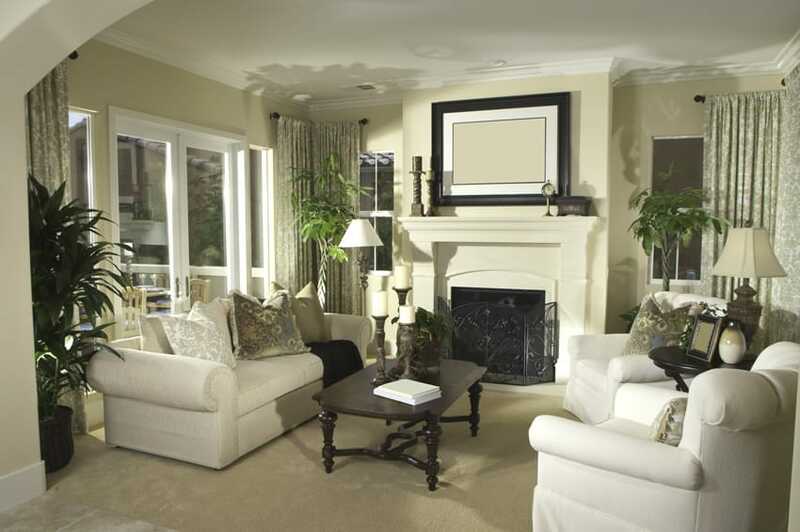 This is a clean and classic living room with subtle browns on white. The walls, ceiling, and floors are covered in solid white paint. This perfectly matches the upholstery on the one seater sofa withe a matching leg rest on one corner of the room. More people could be accommodated on the 3 seater sofas with brown upholstery in the middle. This is accentuated by subtle prints on the throw pillows and the carpet that lies bellow the white center table on an intricately shaped metal framing. This is a modern country living room that perfectly mixes color, texture, and patterns. 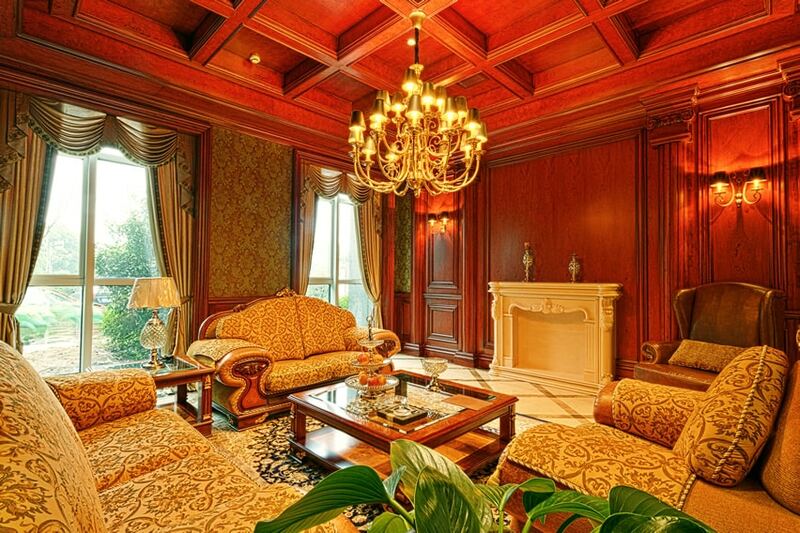 The cream walls are decorated with nine wengue stained disc-shaped wood carvings perfectly aligned in a 3×3 square. The lack of edge on these circles is contrasted by hollow rectangular wengue frames on its side. The same wood stain is used for the 2 wooden seats with white upholstery that add accommodation capacity to the gray sofa set with metallic green and brown throw pillows that match the curtains. This is a simple yet classy living room with noticeable wood furniture that stand out on from the lighter shades around it. The center wengue-stained rectangular table lies above a light brown carpet and across an oatmeal colored sofa with throw pillows and various patterns. The flooring has a tiled matte stone finish in varying hues of oatmeal, taupe, and light gray. This classic living room has a high solid white ceiling with exposed trusses. The room is well lighted and is even made more spacious-looking by the light cream walls . The oatmeal-colored floor is covered by a brown carpet were a cherrywood center table lies in the middle of two one-seater sofas in red upholstery and one sofa in white upholstery that can accommodate more people. The sofas are matched by patterned white and red pillows, respectively. This simple living room gives a very homey and comfortable vibe with its eath colors. A center table with oakwood framing and stone top lies at the center of two sofas in white upholstery. 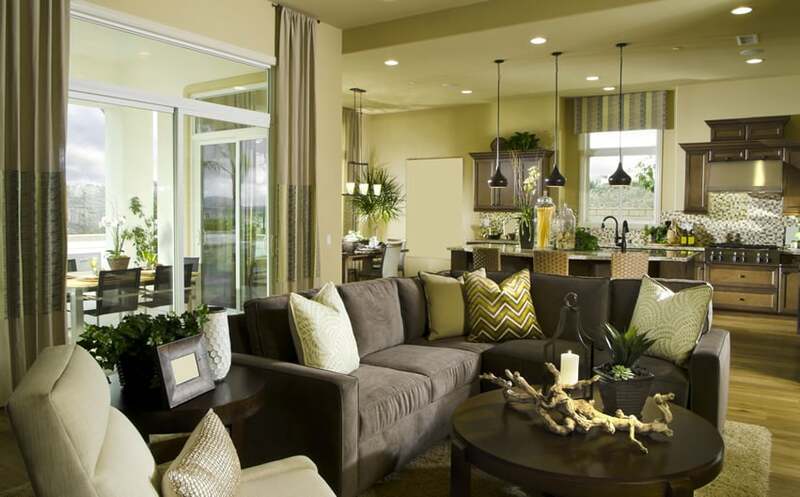 The brown throw pillows match the light brown carpet and other accents while green plants are added to give more life to the neutral color scheme. This classic living room makes use of a well matched and monochromatic brown color scheme. The floor is covered in an oatmeal colored carpet that matches the light brown wood finish on the center table top and sofa’s framing. The sofa is a slightly darker shade of brown that makes the darker wengue stained center-table feet and mirror frame and cherry wood boxes on teh side pop out. 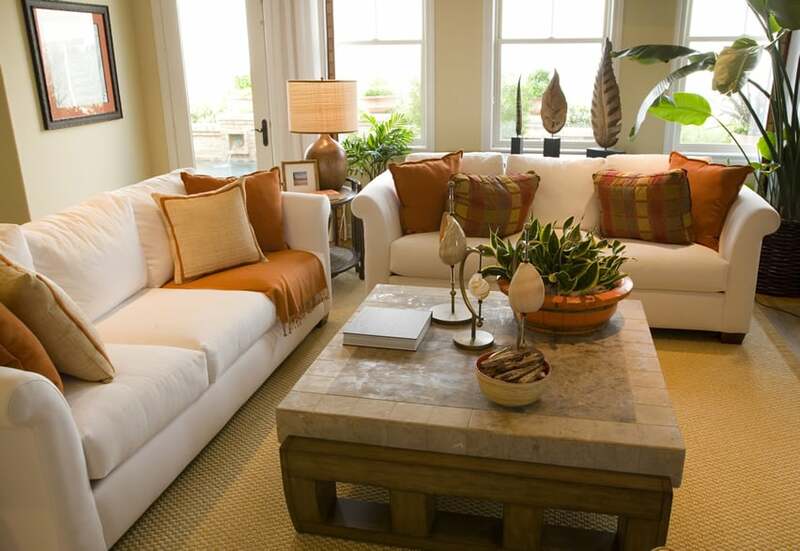 Touches of reds, greens, and gold could be found in plants, throw pillows, and other elements in the room. The center table of this living room demands attention with it’s circular metal framing with a clear glass on top. It is neatly placed at the center of a beige carpet that match the upholstery of the bigger sofas. The light color scheme goes well with the wall colors and fireplace molding, and is accentuated by green ornamental plants and throw pillows of a darker brown shade. This is a small and modern living room with a simple and low square-shaped oakwood laminated center table with wengue edges. The whole living room lies on a big woven beige carpet. 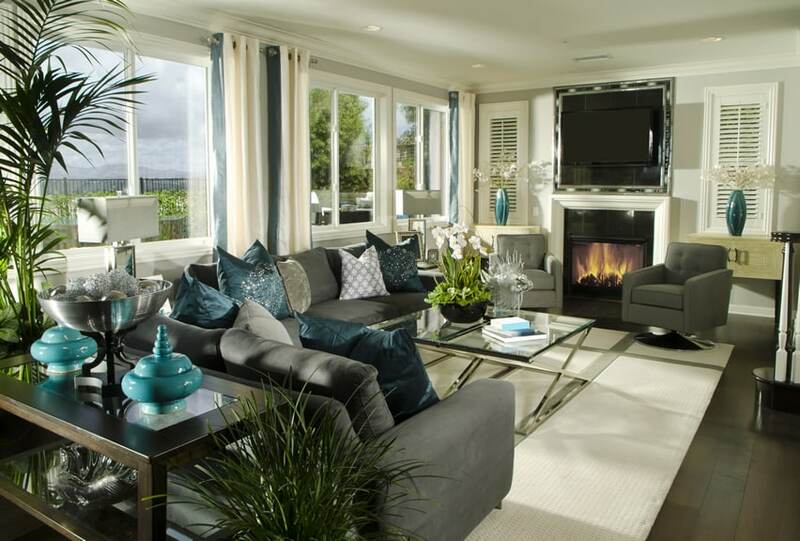 The white walls and big windows make the room appear more spacious, despite the large sizes of the sofas in white upholstery with accents of blue and black. Ornamental plants are placed inside the room to add color and life to the space. 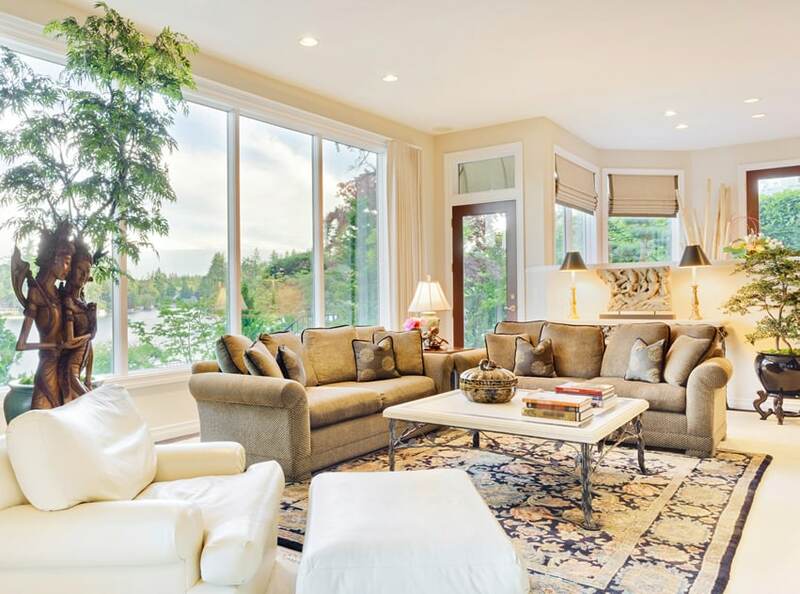 This large open-layout living room uses a light and cool neutral palette, making it a perfect communal space. Walls are painted with a light gray color, contrasting with the dark warm-gray ceramic floors. The dark flooring helps the leather-upholstered white sofa stand-out. A small living room with a Mediterranean and Empire style inspiration, this space effectively combines different styles of furniture pieces and accessories to create a space with a lot of character. Its walls are painted in a light yellow color, has dark Oak wooden flooring and different furniture styles. You will however notice the consistency of the blue tones used in the room and the striped yellow fabric which helps pull together the look of the space. While most living room designs separates the fireplace area with the TV area, this design combines the two elements to create this large modern living room, perfect for entertaining guests. It has a simple neutral palette with a touch of oranges evident on the Pine wood, bricks and throw pillows. 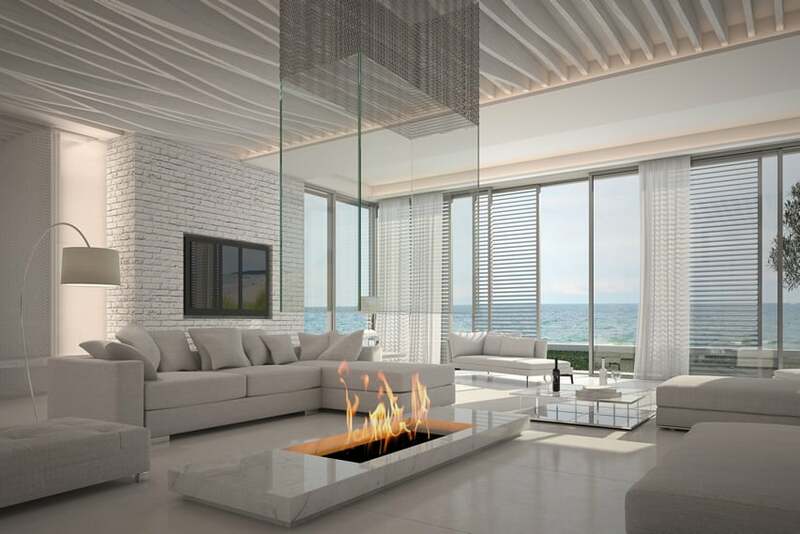 The long wall in front of the gray sofa divides itself into the TV area section and the electric fireplace by using the structural column as a divider in between. This simple country-style living room gives a vibe a of a classic cozy living room with a hint of modern design aesthetics. The dark ebony toned woods are off-set by the white upholstery, and the dark blues add a pop of color to the space without being too bold and out-of-place. 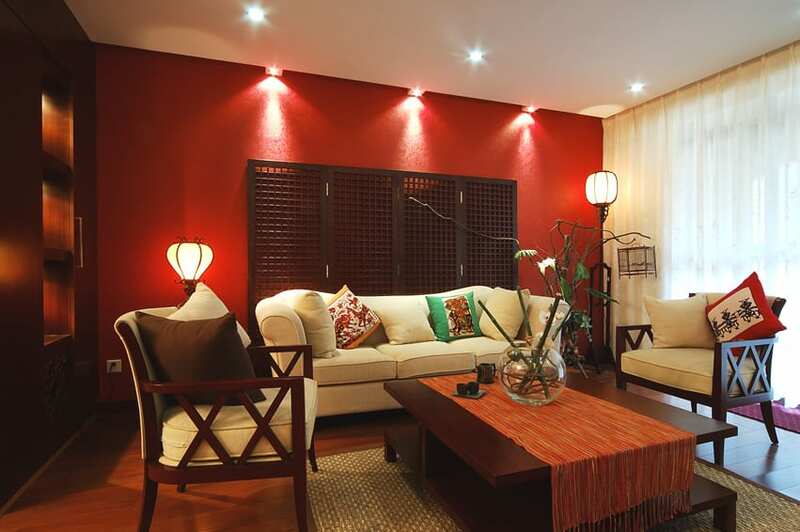 An Asian-themed living room which capitalizes on the use of wood finishes and red as an accent color. You will see a large accent wall painted in red, a privacy folding screen and other wood furniture in dark mahogany, as well as wooden floors. The off-white upholstery used in all furniture pieces help tone down the reds from the wall and the wood finishes, while the white sheer curtain of the large window helps brighten the space and give it a soft-focus. This living room perfectly balances colors, textures, and patterns. 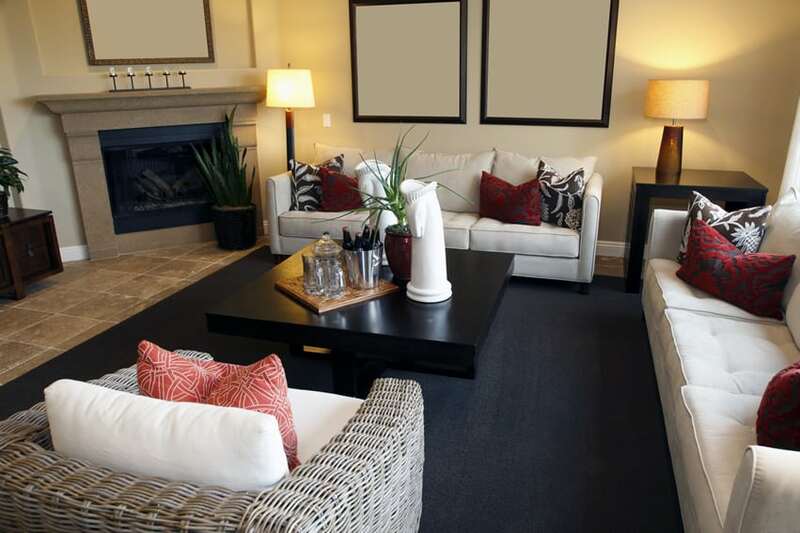 A glossy black center table could be found in the middle of the room right above a black textured carpet. Sofas in plain white upholstery lie on top of it with patterns that could be found on throw pillows and the rattan framing of the one-seater sofa. The brown stone tiles, yellow lights, and ornamental plants add more color to this place. This makes use of modern furniture pieces that make use of shapes to maximize space and add aesthetic value to the living room. The three-seater sofa has a curved shape that complements the round and low center table with wengue wood framing and clear glass on top. The said sofa has an oakwood framing that is mostly covered by swirly brown patterns on white. 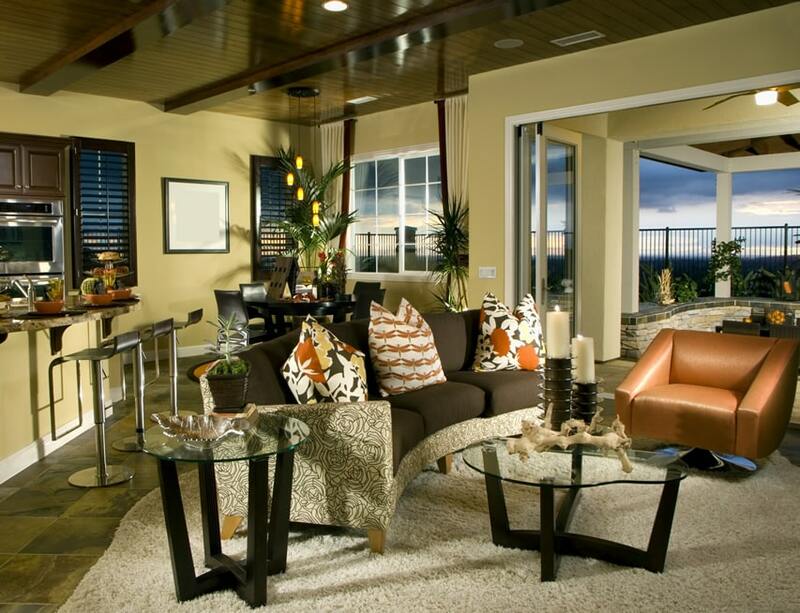 Plain dark brown upholstery lay on top of it with patterned throw pillows in brown, white, yellow, and orange. The tan in the pillows are matched by an edgy one-seater sofa on the side. This is an elegant living room that makes use of massive furniture and curvy wooden edges to make the room look more sophisticated and bigger. The high white ceiling is adorned with moldings and an iron chandelier. 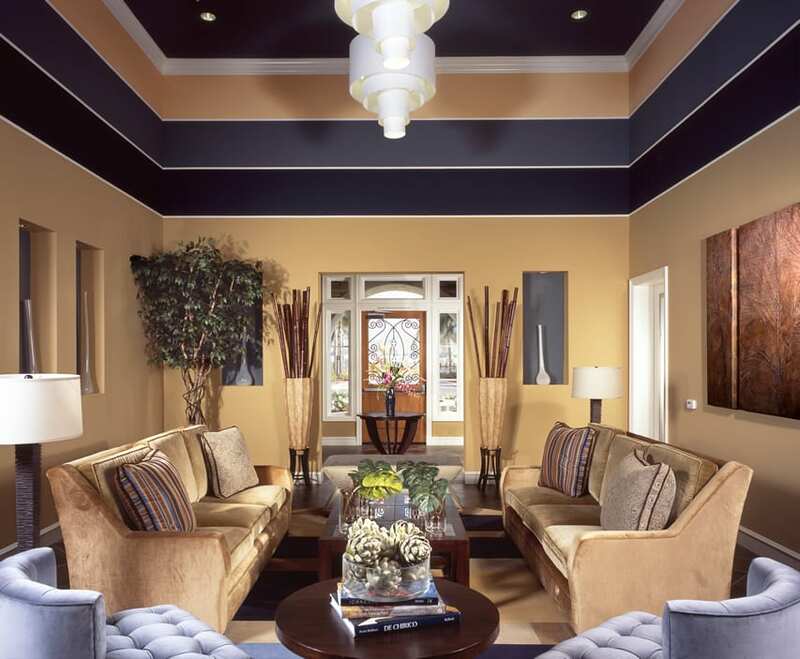 The classy curves in the moldings match the curves that could be found in patterns all over the room. The chestnut wood on the sofa framing matches the tables are adorned with different patterns in varying shades of brown. 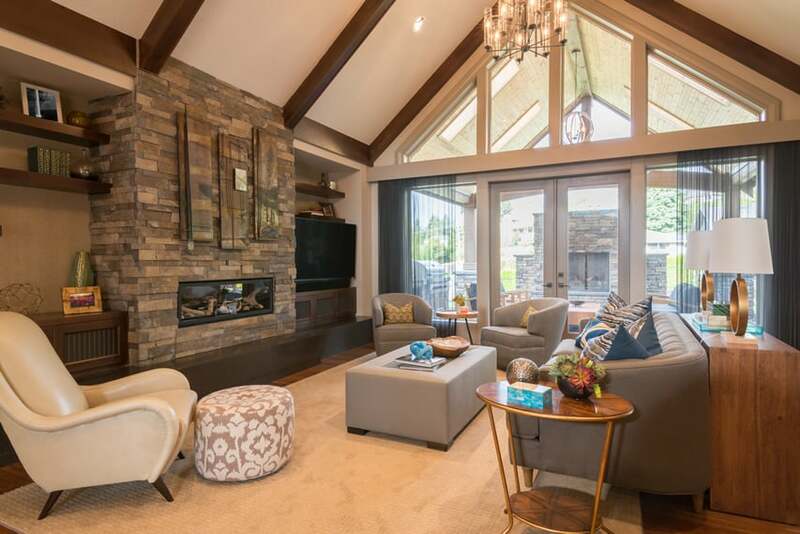 This spacious living room has lots breathing space to offer with it’s high white ceiling with exposed trusses. The walls vary from plain taupe to brick stones. Cabinets and shelves in dark chestnut add texture and diversity in the textures. The floor is mostly covered in an oatmeal-colored carpet with a sofa set in gray upholstery that perfectly matches the center table. 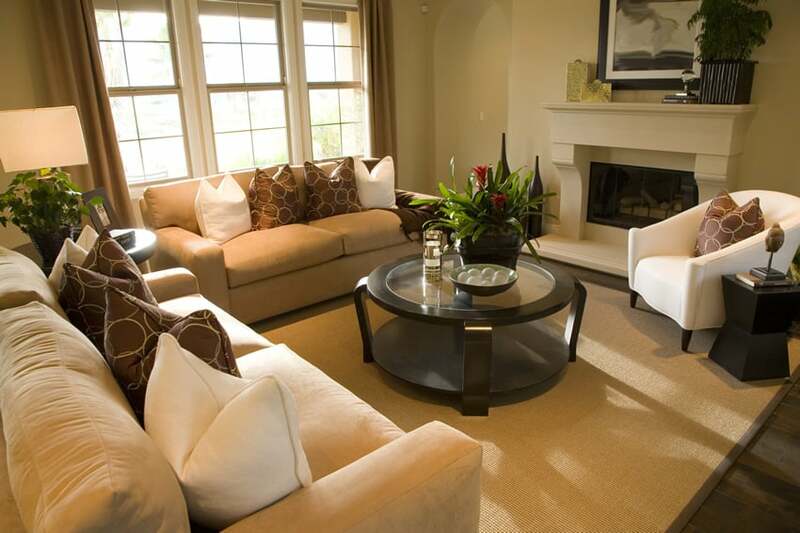 This is a classy living room that exhibits cleanliness and symmetry. 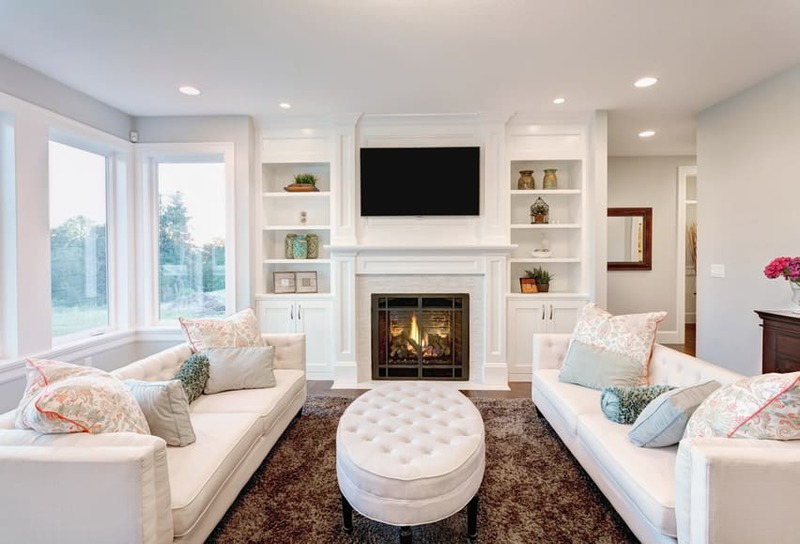 Solid white shelves and cabinetry lie symmetrically on both sides of the fire place and TV, the same way that two long sofas in white upholstery lie on both sides of the furry brown carpet with a round chair in the middle. This is another living room that follows the rules of symmetry strictly. Two one-seater sofas in blue upholstery whose round edges perfectly match that of the wengue and round-shaped coffee table in the middle. More seats are provided by two more sofas in brown upholstery, whose length and edges complement that of the rectangular dark stained table in the midst of it. Walls and floors have a light yellowish brown tone which is complimented by gray and black lines near the ceiling. 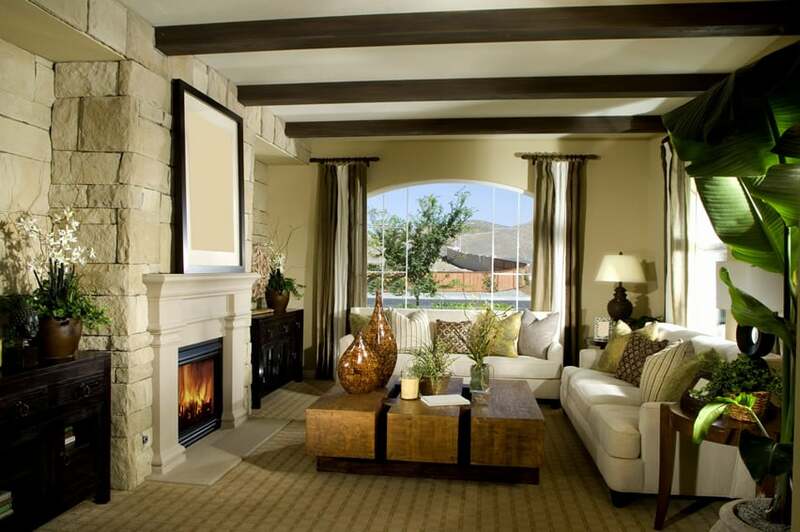 Elegant living rooms with fireplaces provide a focal point to arrange furniture around. This country-style living room has plain cream walls and an intricately patterned light brown carpet that helps frame the furniture and keep things together. A bigger sofa in dark brown upholstery lie opposite to two one-seater sofas with a lighter shade upholstery, but has the same swirling pattern. More curvy edges could be found on the corners of the rectangular center table in chestnut brown, the edges of the sofas, and wall decorations. This living room makes use of a small space beside the dining table. A solid black coffee table lie at the center of an oatmeal carpet. A lone seat in glossy deep brown leather upholstery lie on one side with a small round table in the same black stain. Two bigger sofas contrast these dark shades and match the light carpet. Ornamental plants are added to give life to the room. This is a modern living room that lets textures speak for itself. Furniture and other surfaces play with different kinds of texture while all edges are mostly flat and square. 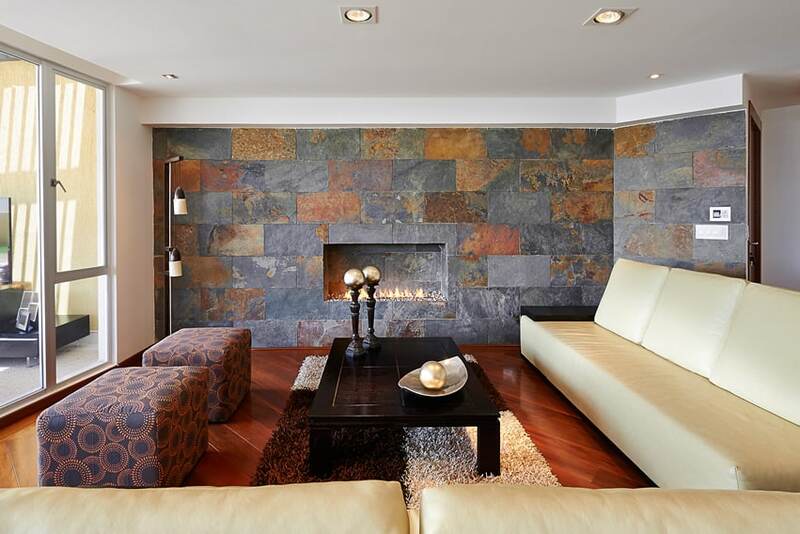 The walls are rich in color with cool grays and warm browns on tiled matte stones. The slate accent wall is contrasted by the glossy cherry wood floor were a furry oatmeal carpet holds a wengue rectangular coffee table. More people could sit and gather on the long sofas in white upholstery and the two small sofa seats in a gray upholstery with tan patterns. This bright white living room has a doll house theme. 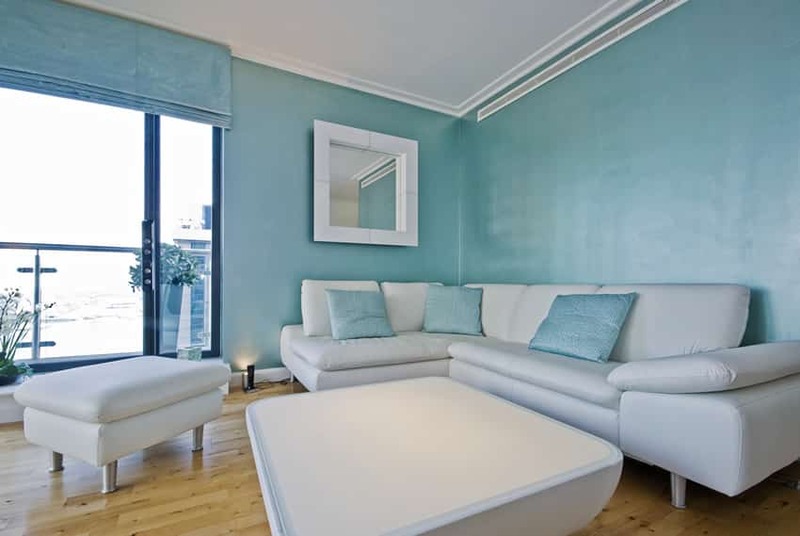 A big light blue lounge chair with a leg rest and golden metal framing is attention grabbing on one side, with the walls and ceiling painted plain white, just like the plain white sofa that makes wise use of space by occupying an entire corner of the room. A glossy white round coffee table with a hollow space underneath could be found right in the midst of the sofa. This living room has a very Asian vibe with all the patterns used for some upholstery and throw pillows. 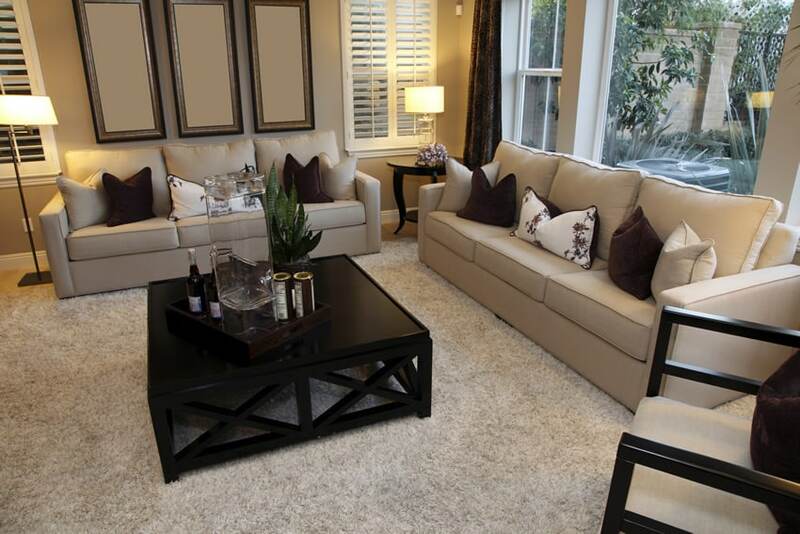 A taupe carpet covers the floor and matches the double-seat sofa in the same color of upholstery. A glossy oak wood square coffee table with curvy edges lie in the midst of two more single-seat sofas that are adorned with various Asian patterns. The plain white walls are adorned with two frames that share the brown and red tones that could be found around the room. 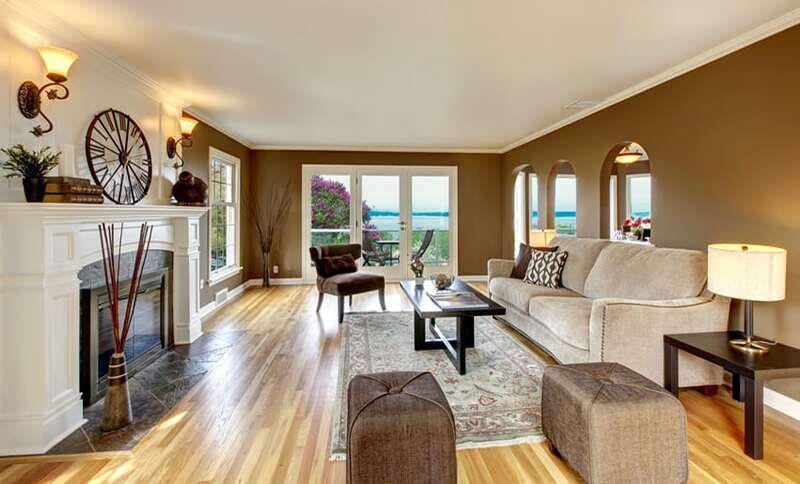 This spacious living room has plain gray walls with a white ceiling and window panels. This is matched by two small sofas in white upholstery. More people could be accommodated in the room with a wider brown sofa that matches the intricately patterned brown carpet. The light shades are contrasted by ebony furniture. The fire place is highlighted with warm brown stone tiles and a silver geometrical mirror on top. The room is made environmentally friendly materials with its source of lighting coming from a skylight window placed strategically on the ceiling. Furniture in varying shades of gray could be found in the room, starting with the light gray walls and seat upholstery with some pillows in a darker shade. 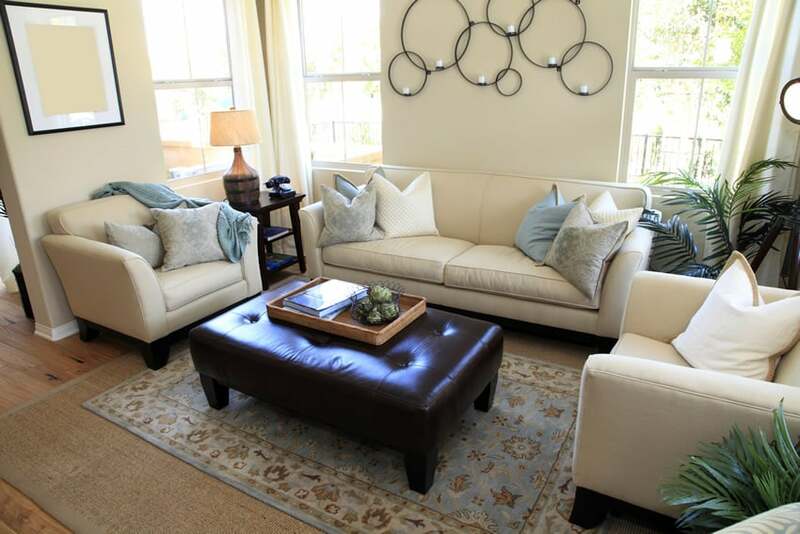 The rectangular coffee table in the middle of the sofa matches the white framing of the two seats that are positioned near the big gray mirror. Textures on one side of the wall and mirror frame balance out the plain solid colors and the oak wood flooring accentuates the monochrome. 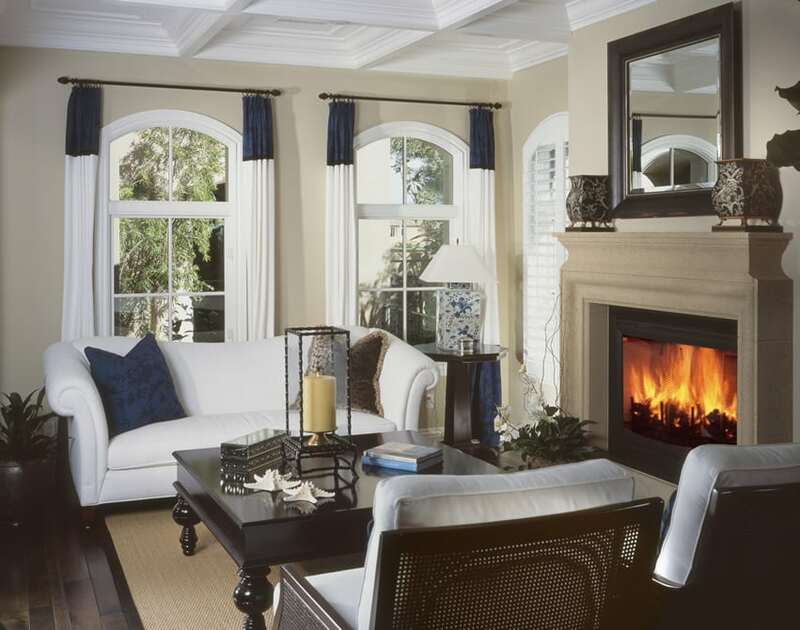 This classy living room has a white ceiling that matches the white upholstery on the sofa set and the white fireplace. This white color pops out from the oatmeal colored floor and cream walls. The dark stained coffee table with unique curvy edges contrast the light color scheme with the intricate patterns on the black iron cover on the fire place. Ornamental plants give some greens in the room. This living room makes use of big open spaces in its windows and indoor arcades to give more illusion of space to the already spacious room. A long sofa with an oatmeal colored upholstery provides room for a lot of people to gather, together with smaller single ottomans and a lounge chair with a darker brown upholstery. Wooden tables have sharp edges and are stained wengue, which contrasts the light oak wood floors and beige walls. This small living room is covered with a walls in solid light yellow paint. 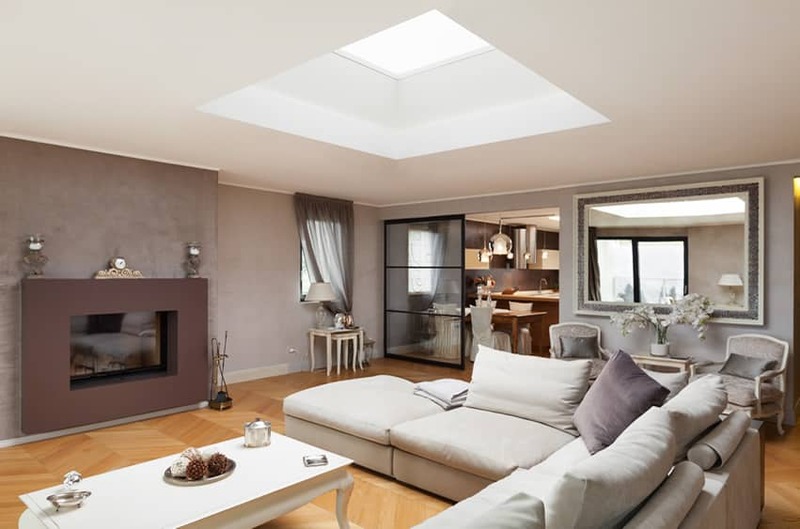 The light shades on the wall and a big window creates an illusion of space in the relatively small space. The light shades are contrasted by the dark gray sofa upholstery and wengue tables and are accentuated by olive green pieces. This simple and classic living room makes use of sharp edges and mostly straightforward lines to set the straightforward feeling that it gives. 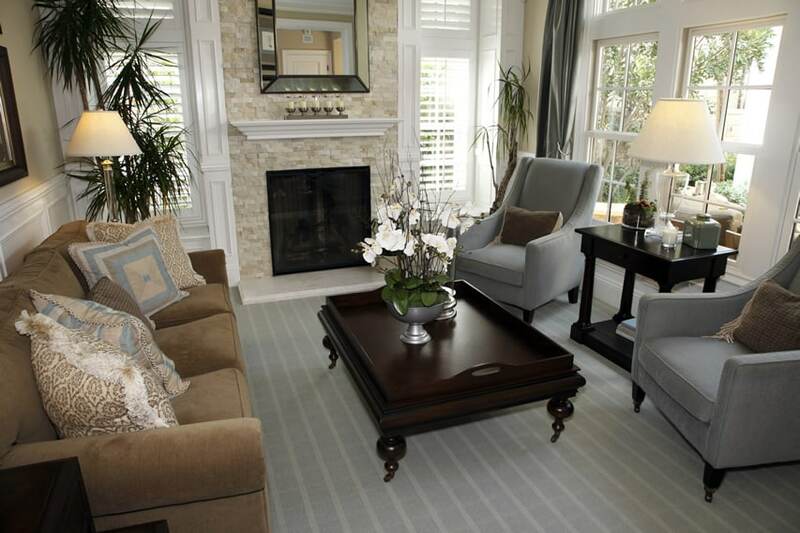 The furry oatmeal colored carpet matches the upholstery and light taupe walls. This is contrasted by the ebony square table and chair framing. This living room makes use of simple furniture pieces to highlight the breathtaking view outdoors. It has warm solid light brown walls with white window framing that match the one-seater lounge with a leg rest in white upholstery and a center table with black iron framing and white table top. Sofas in brown upholstery provide more space for sitting, and some potted ornamental plants are placed inside to bring some of the natural beauty outside into the house. This elegant country style living room has a white ceiling with exposed wengue trusses. The walls and floors have a light oatmeal color in different textures. The floor is soft and carpeted, one side of the wall is lined with bricks, while the others are in solid light taupe. The mahogany center table has a tiled oak wood top and is surrounded by sofas in white upholstery. Ornamental plants and decorative vases adorn the room and give it a more homey feel. This is a classy living room that makes use of a sofa set and a bench in white upholstery with patterned red, black and gold fabric for the carpet and pillows that add a modern Asian feeling to the living area. The windows are eye-catching with its high panels that overlook the lush green trees outdoors. This living room is very homey with woven sofa framing, carpet, and table top that give a country style feel to the room. Sofa set upholstery are in striped khaki and white with touches of light blue patterns. The light olive walls are mostly dominated by big windows that provide a good view outside. This elegant living room makes use of a mix of sharp and soft edges to play with dimensions. This could be shown on the straight and sharp cut of the tall windows, tray ceiling, and frames on the wall, with moldings and sofa sets that have soft rounded edges. 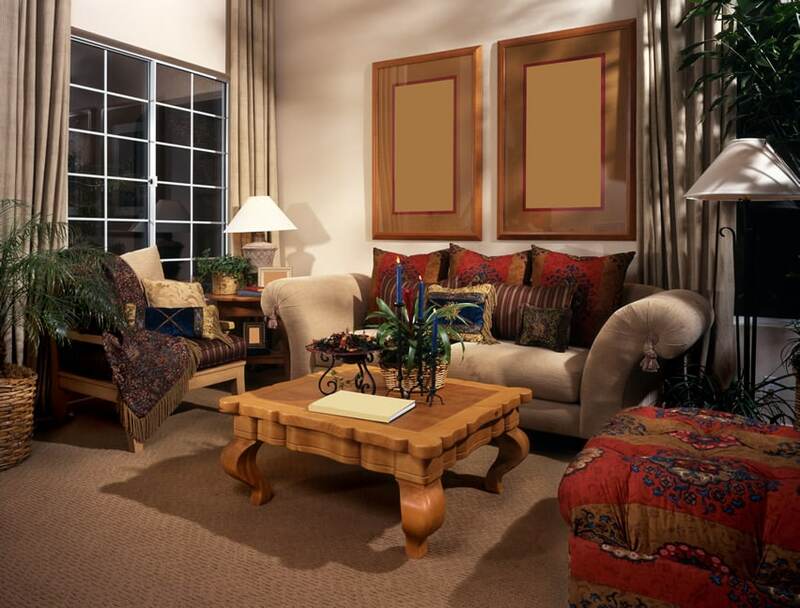 The sofa sets give a fading oatmeal color with golden frills that cover the framing. The carpet and table’s feet are adorned with wrought iron swirly patterns. A beautiful custom fireplace is central in the room and is the main focal point for positioning furniture and gathering. This simple and classy room has a very soft and comfortable feeling with its soft oatmeal sofas in oatmeal upholstery with an ebony framing. Instead of a table, a bench in a comfy dark brown leather upholstery lies among the pretty light blue and brown carpet with shades of light blue that perfectly match that of the pillows’. Natural lighting comes straight and bright from the windows. This is a bright and modern living room that is naturally illuminated by the tall windows that overlook a large open space outside. More light is reflected by the glossy solid white flooring that matches the same clean and white paint on the walls and ceiling. The sofa sets are in white upholstery with black pillows that match the ebony table with a glossy black top. More color and texture is added by the gray curtains and beautiful brown and white carpet on the floor. This room has a very cool and soothing feel with its light blue and white color scheme. The sofa sets are in white leather upholstery with textured light blue pillows that match the textured light blue paint on the walls. The center table is noticeably modern with a glossy white laminated base and a frosted glass top. The aluminum sofa framing and oak wood floors add color to the room. This elegant living room makes use of cool light blue and brown shades for its sofa upholstery and carpet.The sofas’ soft edges contrast the straight lines on the striped carpet and the rectangular wengue table. The walls are in a solid oatmeal color that matches the bricks that surround the fireplace.While more straight patterns could be found on the window panels. 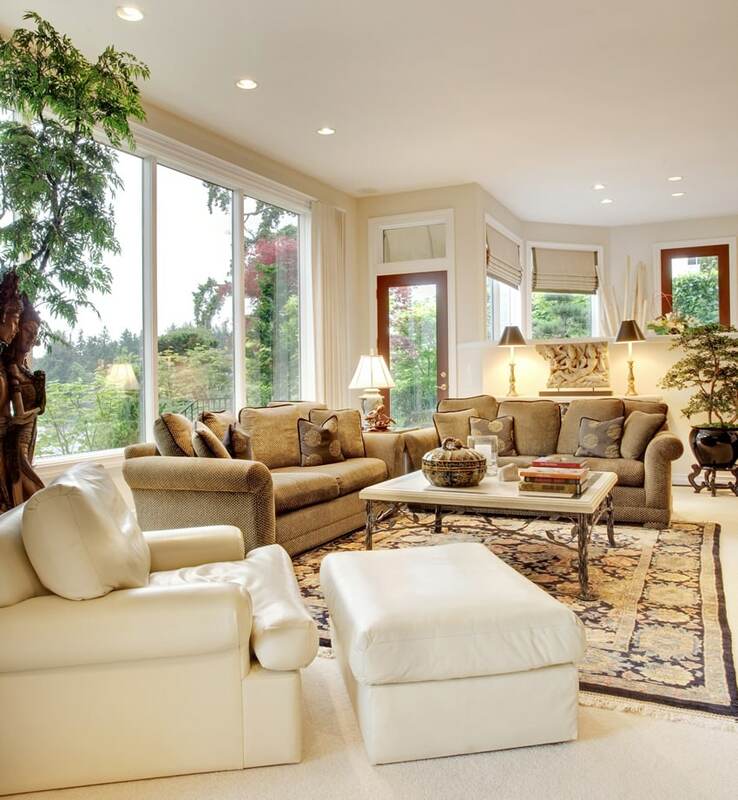 This living room has a very elegant feel that is magnified by the high ceiling and tall ornamental plants. Each wall has a different pattern, with one side holding windows that allow more light inside. The other wall has a light yellow color that highlights the white solid paint on the fire place. On one side, the wall is painted brown with a checkered pattern created by the white panels. 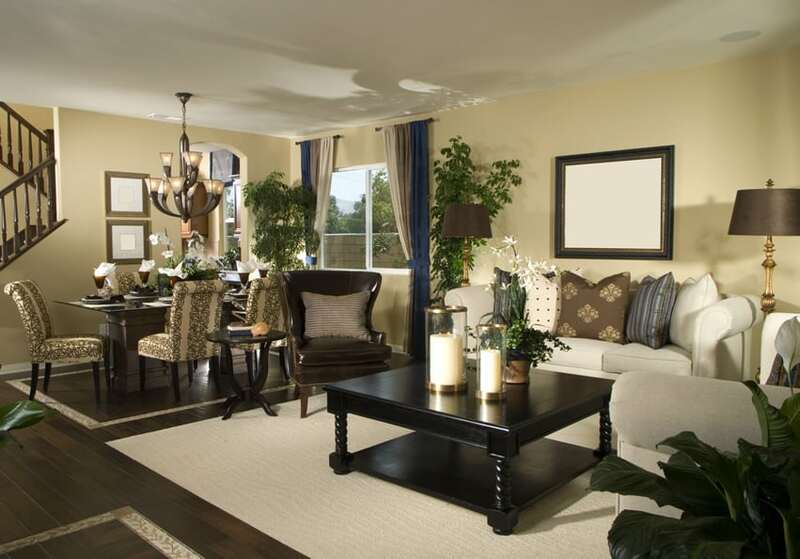 This brown and white color scheme is followed by the same colors on the carpet and sofa upholstery. More people could be accommodated on the intricately patterned three-seater sofa on the other side.